Heat oven to 375°F. Line 15x10x1-inch pan with foil. In medium bowl, mix beef, taco seasoning mix and green chiles. Shape into 8 (3-inch) patties. Place in pan. Bake 10 minutes; turn patties over, and bake 5 to 10 minutes longer or until meat thermometer inserted in center of patties reads 160°F. Top each patty with piece of cheese. Bake 1 to 2 minutes longer or until cheese is melted. Place one patty on top of each slider bun bottom. 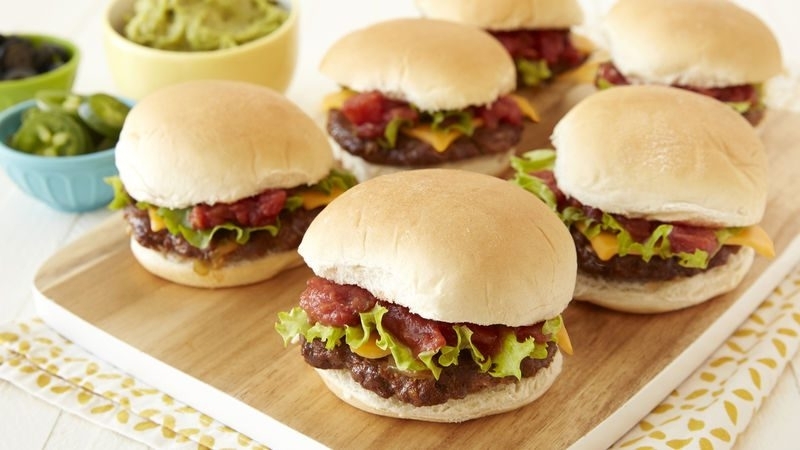 Top each patty with lettuce and salsa, and place top of bun on each to serve.